The iPad has matured into a serious musical instrument and production tool. So it only makes sense to give it a serious audio interface. It’s also worth mentioning that this is an option for Linux, too – especially with Bitwig Studio running native and various hardware options out there for building dedicated music devices. MOTU doesn’t officially support that, but that’s no reason you can’t plug this into your Raspberry Pi (and if you’re sophisticated to run Linux, you probably don’t worry too much about calling MOTU support). Linux is the unexpected recipient of iOS’ class compliant support. 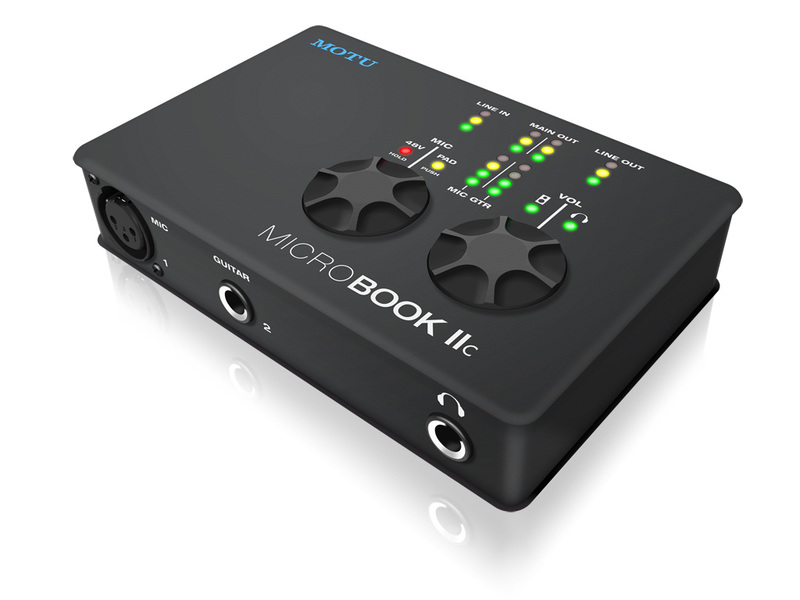 Steinberg, Roland, RME, and others have all been adding some worthwhile devices to the mix, but MOTU’s MicroBook IIc has some specs that could make it a perfect fit. For one, it’s US$249, but focuses on some higher-spec features. There’s a mic input and guitar input, each with digital trims that make setting level easier. And you get line input – both 1/4″ and stereo mini, plus balanced stereo out (and minijack out, too). That particular complement of I/O could make this the ideal companion to the iPad (or, for that matter, iPhone). For a solo musician, you’ve got an easy way to record, so you don’t have to lug an unwieldy laptop over to the studio or practice room. And for live gigs, you have everything you need to capture shows. MOTU also packs their interfaces with extras, and the MicroBook inherits those features from its bigger siblings. There’s a built-in 8-bus digital mixer. THere’s a multi-band EQ, compressor, and test-tone generator. There are instrument tuner and analysis tools, including FFT display and oscilloscope. There’s even MOTU’s bundled AudioDesk DAW. All of that means this is more or less an all-in-one mobile toolkit, and you can pass off duties here to an iPad even if your laptop and another interface are busy in the show. I’m curious – how do you use your iPad on the go? And what audio interface are you using? Let us know in comments.